Part number 552954-508 gold print ribbon for Datacard SP35 Plus, SP55 Plus and SP 75 Plus card printers. 1500 images. 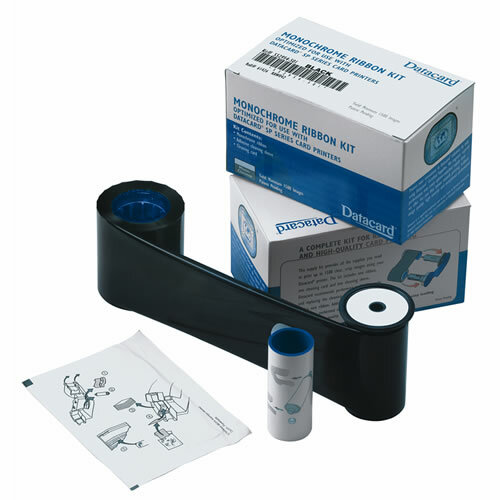 One ribbon, one cleaning card and one cleaning sleeve is included in the gold printer ribbon kit. The product contains cleaning supplies for the SP35 Plus, SP55 Plus or SP75 Plus Datacard ID card printers. Datacard's SP Plus Series card printers use printer ribbons designed sepcifically for Datacard printers. When a Datacard print ribbon has been loaded, the printer senses the ribbon load and begins card printing. The printer will only print images when Datacard color ribbons are installed. Ribbons that come from Datacard Certified Supplies have a blue core with platinum flecks.